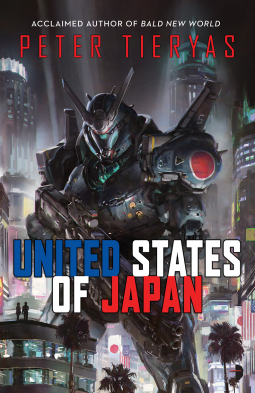 After finishing United States of Japan, I find myself in another review dilemma. Due to an impressive fascination with quantum entanglement and paradigms from the current comic nerd culture, alternate fiction has gained large success. A genre I am quickly starting to disapprove of highly for its historical dilution. I selected this novel for the mecha from the cover and an admittedly intriguing description. I knew I would struggle with the content, but I also am keenly aware that books are read for the entertainment value. Therefore, I will base my review solely on that value. This is a story of North America if Japan had won the exchange at Pearl Harbor. A big manipulation of the timeline for sure. I will give credit to the vibrant reality of the world Tieryas created. The whole book really felt like a Japanese colony. The foods, the culture; they all felt very Imperial Japan. I enjoyed the authenticity of a Japan that developed from the Empire culture since our concept of modern Japan would not exist in Tieryas's paradigm. Ishimura and Tsukino are incredibly memorable characters with an impressionable dynamic. They make the story line flow along in a realistic timescale. They moral struggles they face as we learn about their growth in a colony filled with oppression is hooking. Honestly, they were really the only reason why I managed to finish the book. There were two major factors that killed the joy of the book for me despite the compelling character development. 1.) NO MECHA until 52% of the book. What? How can you put a giant, shiny, awesome mecha on your cover--one in which you base the ability to manipulate timelines--and then not have it involved to well after half the book has gone by? And then it doesn't actually see action until 90%? I'm hurt. 2.) People are forced to assimilate to Japanese culture or be neutralized. Extreme. Yet they didn't rename any of the American cities? Seriously? Germany renamed all the East Coast cities because there was no way they were accepting another culture into their own. But California gets to keep all their names despite the open despising of their culture? Didn't jive with me. UPDATE: After a very interesting explanation from the author, which I truly appreciated as a reader, I accept the naming convention "in spirit of syncretism of Shinto, as well as for dramatic purposes," which ties in with the research that has clearly been done of the Japanese culture by Tieryas. Both of these factors made the book lack an air of authenticity to me that is an absolute must if I am going to read alternate fiction. That is my humble opinion and recognize that this book from its writing alone has the power to be a HUGE success. It is motivating, compelling, and fascinating narrative. The characters are real and gritty. It is available now; so check it out and see what you think for yourself.